“Why does my birthday come only once a year?” As a kid, I used to frequently pester my mom with this question. Being youngest of four children in my family, I was the most pampered one. So, that meant extra pampering on birthdays. The day used to begin with bear hugs & wishes from mom, papa and my siblings. In the days of exclusive landline phones, every phone ring would bring a sparkle in my eyes as family friends and relatives would call to extend their wishes. I never missed school on my birthday, for it was one day when I would be treated like a princess by my friends. Birthdays were an occasion to flaunt the new frock bought just especially for the day, since we were allowed to give school dress a miss for the day. As I would distribute gifts to the class who joyously sang “Happy Birthday” for me, I felt like the guest of honor. And yes, the Maths teacher was also super sweet to me that day! Back home, everyone would be busy preparing for the evening party. I have fond memories of the invitations, cake, confetti, gifts, food, games, dance and lot of fun with friends! Of course, next morning would feel like a hangover, especially if I had school. With time, my definition of birthday celebration too changed. From lavish parties, birthdays began to be all about a cool eat treat with friends, gifts of my choice from parents and a nice family dinner. The huge transformation in my birthday celebrations came after I began working. Birthdays became a much more private affair. In fact, the same me who enjoyed the attention during school days would turn pink and get conscious when my team sang a loud “Happy Birthday” followed by wishes from the entire floor. Often I think about the change and it surprises me. I guess we all mellow down with age and value quality to quantity. What are your memories of birthday celebrations? 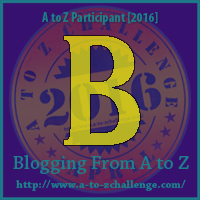 This post is written as a part of the April A to Z Challenge 2016. As an adult, I like quiet birthdays more than a party. To be frank, I have never celebrated Birthdays after 2nd class. Before that, I had no idea though. But yes, there was a cake by mom and a great family meal. But thats pretty much it. My birthday is a quite family affair. I have pictures from only one of my birthday parties as a child. But I know there were others. In my young teen years, sleepovers were the big thing. As I got older birthday parties were more about a big family dinner in which the person whose birthday we were celebrating got to choose the menu. Feel of euphoria is getting dried up when you begin mellow with age. Good luck for the challenge. Can We Bubble Wrap Their Childhood? With Flintobox, summer vacations rock!